On the final day of the 2002 / 2003 football season Chelsea Football Club recorded a famous 2-1 victory over Liverpool, thereby qualifying to play in the following seasons European Champions League competition. Resigned to losing Gianfranco Zola, who had recently been voted the club's greatest ever player, and with no money available for Chelsea's charismatic coach Claudio Ranieri to strengthen the squad, the prospects for the coming season looked to be self-limiting. That had been the general consensus of Marco, Young Dave, Ugly John, Ossie and the rest of the Chelsea Gate 17 boys as they frittered away the summer months waiting for the new European campaign to begin. Enter Roman Abramovich. The billionaire Russian oligarch purchased the club and financed a spending spree unprecedented in the history of the game. 'Glorious unpredictability,' that's what Marco called it ...that Chelsea factor, you just never knew what was going to happen next. Whatever it was, the Gate 17 boys had no intention of missing any of it ...they'd even planned to make a spiritual pilgrimage to Sardinia to watch their hero Zola. 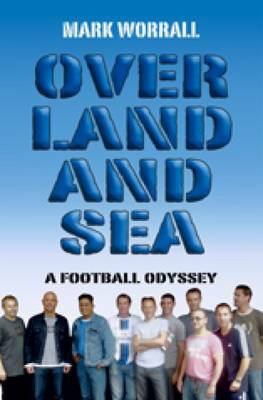 Over Land and Sea re-writes the current trend in depressingly violent football literature.